Like any college basketball fan, he scans the NCAA Tournament bracket every year. He knows that’s a mistake, but to this day, Stevie Johnson can’t bring himself to make the Spartans a pick to click in March, despite their propensity to be at their best on the sport’s grandest stage. The multi-talented former Iowa State standout knows that from experience, of course. Nearly 17 years ago, Michigan State shattered his dream of playing in the Final Four. His college basketball career ended in the Elite Eight — and at the time, he dwelled on the missed opportunity rather than the impressive achievements that marked that 1999-2000 season. “Going to the Elite Eight was great but I couldn’t appreciate that because I felt like we didn’t play our best,” said Johnson, who averaged 9.1 points and 6.1 rebounds during that splendid season that ended in the controversial 75-64 loss at The Palace of Auburn Hills. “We played against a great team, but there’s so many small things — I just remember small things about the game. That’s what coach (Larry Eustachy) harped on all the time, the small stuff. and If I would have done this, or I would have done that, the outcome could have been different. They do now. Everybody with even the slightest affinity for the Cardinal and Gold does — and did. So what did Johnson do when the loss still stung? He went back to work. Fortunately, others on ISU’s campus had been asking that very question for years. Guys like Paul Rhoads, who would attend basketball games and approach Johnson later, told him he’d be a great addition to the Dan McCarney-led football program he served as an assistant on. No one laughed when then-running backs coach Tony Alford stopped by for a chat during that Elite Eight-framed senior season, though. “You know you could come back and play. One year, you could have eligibility for. You could play football,” Johnson recalls Alford saying. 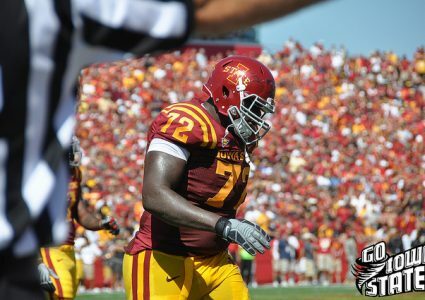 The possibility intrigued Johnson — who’d given up football as a sophomore in high school in part because his father, Cleo, was leery of the sport after serious knee and back issues ended his two-year NFL career far too early. But Johnson wanted a second opinion, so he turned to his roommate for advice. 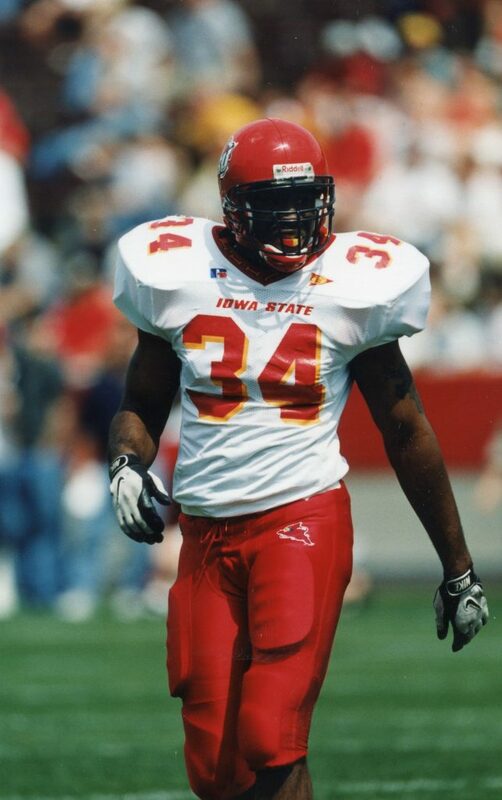 Oh, and that roommate happened to be former Cyclone and NFL star Reggie Hayward. “He was like, ‘Yeah, you should come out,’” Johnson recalled. 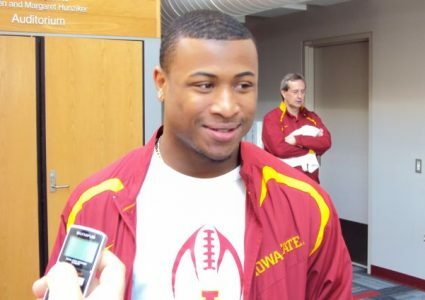 So it happened that Stevie Johnson made modern-day ISU history. He played a key role in helping the Cyclones roll within a few breaks of the Final Four, and possibly an NCAA title. Then he played linebacker on ISU’s only nine-win football team — and mere weeks separated the end of part one from the beginning of part two. Johnson’s amazing athletic journey started with a plastic tee and a fearsome swing. That’s right: All Johnson had as a seven-year-old in small-town and hardscrabble Beaumont, Miss. was T-ball. And he excelled. His team won a state title and would have qualified for a national tournament, but the players’ families didn’t have enough money to fund the expensive trip. Johnson wouldn’t start playing basketball until junior high school. So he reveled in hitting the baseball. Johnson says smacking home runs, putting his head down and circling the bases remains a favorite memory. He’d find one eventually. Two, really. Johnson quickly developed a reputation as an exceptional athlete on the hardwood. He stood 6-foot-3 by the eighth grade. And man, could he rise up and finish. Johnson was even better at football, But dad’s experience-based skepticism of the sport’s safety — and seeing real-time evidence when a friend was injured — led to him hanging up his cleats as a sophomore. Johnson aimed to please. So hoops it was. Life offers it’s twists and turns, though. 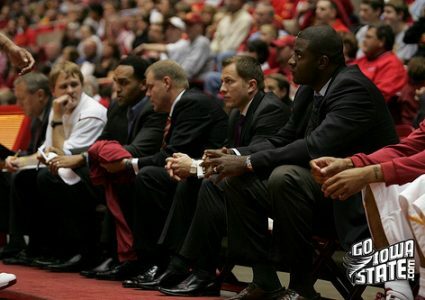 And the next one led to Ames — and the first of two highly-demanding basketball coaches, Tim Floyd. I asked Johnson what it was like to play for both Floyd and Eustachy. He laughed. Johnson — an elite scorer and prized recruit out of high school — swallowed his pride and plugged away. He accepted being an important member of the supporting cast. Rewards, after all, don’t always come in the form flashy statistics. “I was tough enough and smart enough to guard bigger guys and rebound the ball really well,” Johnson said. “I bought into it. I bought into it that I can out-rebound anybody in this league. I can guard anybody in this league from a guard to a big man. So I was able to buy into it and believe in myself that I can do this and Iw as able to do it effectively and I believe that, ‘OK this is important.’ Because as a young kid, you don’t want to rebound and defend. You dont want to be, ‘I’ve got to get a rebound and kick it back out to a shooter’ That’s not fun. Still, he knew he could do more. He yearned to make larger contributions, but it turns out all he provided was more than enough. Much more — as the Elite Eight trip attests. He became one anyway. In Johnson’s 13 seasons overseas, he earned MVP honors in Iceland and became a mainstay among the elite levels in Spain. He finished up his successful career in Germany and now works as an insurance claims adjustor in Studio City, Calif. He was built tough from the start, but learned humility from both his dad and mom, Evelyn and his dad. He learned how to handle adversity from his sister, Ramona, who was diagnosed with Lupus at 16-years-old. “She never complained,” Johnson said. 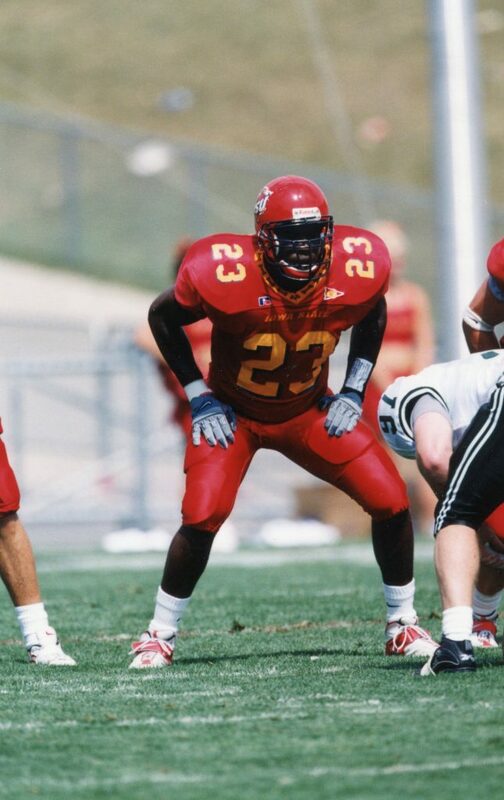 Johnson played in the 2000 ISU spring football game the very same day he attended the women’s basketball banquet. That’s how closely his two banner seasons blurred into one history-making run. But where to start? Johnson hadn’t played at any level for roughly six years. Sure he was gifted athletically, but how could he find a way onto the filed in the rugged Big 12? So Johnson’s journey began in the weight room. It transitioned from the play book to the film room and back again. He was a natural, but being so far behind in terms of concepts and techniques imperiled his rapid and ultimately successful move from the court to the gridiron. He played plenty, registering 17 tackles in 10 games. Johnson helped the Cyclones seal their first-ever postseason win, a 37-29 triumph over Pittsburgh in the Insight.com (now, Cactus) Bowl. 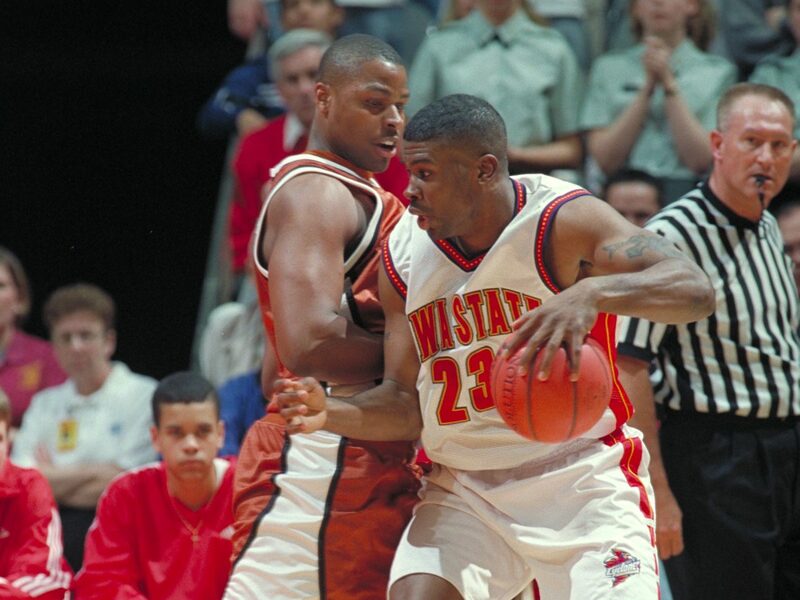 That cemented his status as the only ISU athlete to play on an Elite Eight hoops team and a 9-win football team. Pretty special; both random and by design. Johnson never quit. Instead he steeled himself for each challenge by blending exceptional physical talents with extreme mental toughness and an unconditional team-first mentality. Sports took him a long way. Determination and heart did the rest. He didn’t much care about being noticed, or written about — and to this day, people seem to want to cross his name off an Elite Eight-based list, too. No need. That home run ball’s still sailing toward the horizon, but Johnson’s looking up this time. He’s fondly looking back, too — and asking others to cross something important off their own lists.